Having recently been on a WWII kick, and becoming acquainted with this author on Facebook and Twitter, I had to read his book. Although I am not an expert on WWII, I thought I had a rather complete knowledge of it. Each book I read about it shows me how much I don’t actually know. For instance, in reading this book I learned that the Germans had a submarine base in Norway, that the Norwegians were pretty pissed about it and did everything they could to help the Allies destroy it and the Germans were really bad at coming up with clever names for their bases. 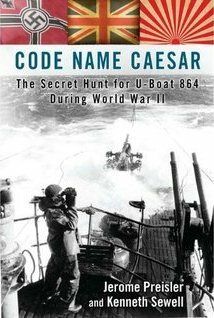 The main focus of this book however is U-Boat 864 and its “secret cargo”, and the fact that the Allies knew about it, and knew it couldn’t reach Japan. When the bombing of the base didn’t destroy it, the Allies had to fall back and try something different. The British submarine HMS Venturer was sent to destroy the U-Boat. This is the only documented case of a submarine sinking another sub while both were underwater (Spoiler? Does anyone not know how WWII ended?). Although a true account, free of any dramatization, this is a thrilling account. We learn some of the history of Norway and the occupation by the Germans. A little bit about bombing missions, why it is so dangerous for a sub to sink another sub while both are underwater, and why it had now developed into a controversial issue for the Norwegians. I really enjoyed this book and recommend it. Posted by Belleza on March 4, 2013 in 2013, History, Non-Fiction and tagged Bombing raids, Jerome Preisler, Library Book, Liked it ♥♡, Nazi-Occupied Norway, Nazis, Recommended to read, Submarines.